Book now the best shore excursions in Limassol. High quality and safety at the lowest prices. If your are looking for Shore Excursion Limassol, book now the best guided tours at lowest price with Ancora Tours. From 2003 we offer you official guides in english, transportation and travel insurance, all included. The highest quality at the lowest rates. Limassol is a truly ancient spot and was built between two ancient cities, Amathus and Kourion. It’s archaeological sites date back for millennia but the city also offers plenty of modern character. You’ll find shops, cafes and vibrant nightlife after dark. What’s eating: Cypriot classics such as haloumi cheese, stuffed vine leaves, or Kleftiko; slow cooked lamb with garlic, olive oil and lemon juice. Souvenir: Authentic Cypriot olive oil for the kitchen, or olive oil based soaps and cosmetics for the bathroom. Join us on our Limassol shore excursion and you’ll see some of the islands most important and beautiful archaeological monuments. We’ll begin at the ancient city of Kourion that boasts a number of archaeological remains. 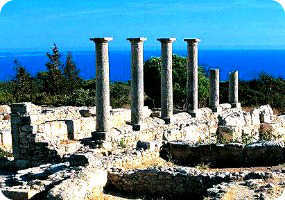 The Sanctuary of Apollo Hylates, an important religious centre in ancient Cyprus is just one of these. Worship first took place at this site during the 8th Century BC and the temple to the Greek God Apollo was still in use until the 4th Century AD. Next stop on our shore excursion of Limassol is the nearby village of Kolossi. Here we’ll explore Kolossi Castle, a former Crusader stronghold associated with the monastic Knights Templar and the Knights of the Order of St. John. The existing castle was built in the 15th century and was considered impregnable. Three storeys high, made of limestone blocks and standing 21 meters tall, the castle would have been quite threatening to potential invaders. Knights poured boiling oil or scalding water from so-called ‘murder holes’ in the castle walls. There’s more to Kolossi than just brutality however. The castle is associated with the production of a sweet red wine known as Commanderia. Named by the Guinness Book of World Records as the oldest named wine in the world, Commanderia was said to be a favourite with Richard the Lionheart. At his wedding at the Castle in 1191 he declared it the ‘wine of kings and the king of wines.’ A more pleasant note on which to finish the shore excursion of Limassol.